Social & Emotional / Is your child overactive? You might want to read this! Moving around is a good way of helping your child pay attention; so the more activity, the better. Playing outside stimulates the production of dopamine and serotonin -both neurotransmitters that are critical for attention, focus, impulse control, and learning. Some children focus and listen so much better after taking a walk or just being around nature. Dr Swanson suggests children spend at least an hour a day outdoors. A recent study at Auburn University found a single 30-minute stint of exercise helped preschooler’s ability to pay attention in class, compared with being sedentary. You can help establish a calmer mood in the room with music. Playing calming music is a great way to lower energy levels. Music helps kids regulate their emotions the same way lullabies help calm a baby. Soft music can help children calm their bodies down, according to the National Association for the Education of Young Children. As children take a deep breath to blow on the bubble they are practicing deep breathing which encourages relaxation. 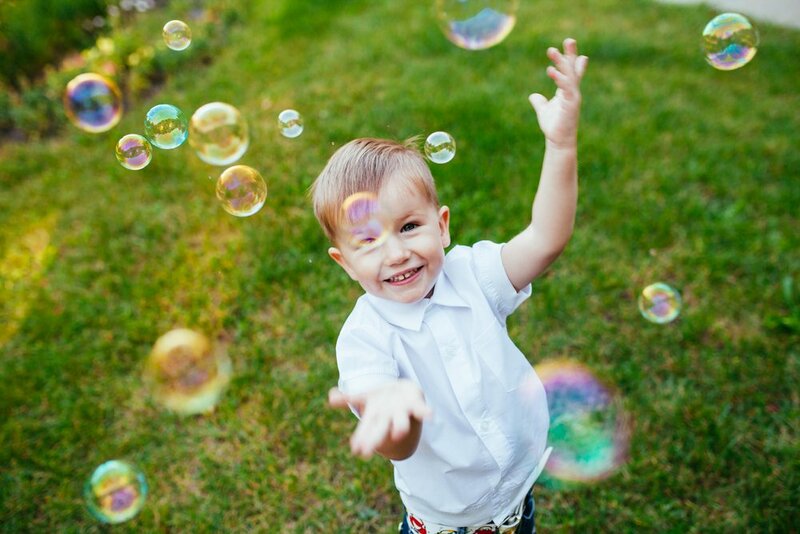 Teaching your little one to blow bubbles slowly and carefully can help calm his mind, body, and emotions!